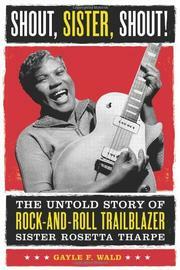 Guitar-wielding gospel grande dame gets her first full-length biography. Though Sister Rosetta Tharpe definitely had an impact on many rock guitarists, the book’s subtitle is marketing sleight-of-hand. Tharpe wasn’t a rock-’n’-roller—she was a holy roller, a Pentecostal shouter and refined picker who was one of the top sacred-music performers of her day. It’s true that she see-sawed between the gospel and secular worlds: 1930s releases like “Rock Me” and “This Train” were church roof-raisers, but she was soon recording with Lucky Millinder’s big band and playing decidedly ungodly venues like New York’s Cotton Club and Café Society. She returned to the gospel road in the mid-’40s, and her career didn’t recover until her embrace by European blues revivalists in the ’60s; she died in 1973, at age 58. Sister Rosetta’s fascinating experiences fail to come alive in this lugubrious narrative. Wald (English/George Washington Univ.) is madly in love with her subject and treats with rapture even such grotesque incidents as Tharpe’s 1951 wedding before a paid crowd of 20,000 in a Washington ballpark. Though based on dozens of interviews, her work reads more like a full-length mash note than a carefully researched biography. The reader learns little about Tharpe’s three husbands, even though the third—Russell Morrison—was her manager for nearly 20 years. Old rumors about bisexuality are mentioned, only to be quickly dismissed. Wald writes virtually nothing about how Tharpe learned to play or from whom, neglecting the historical roots of her dazzling guitar style. Nor does the author have anything to say about the essential, abiding conflict between Tharpe’s sacred and worldly sides. Sister Rosetta deserves better than this sleepy, uncritical tome.